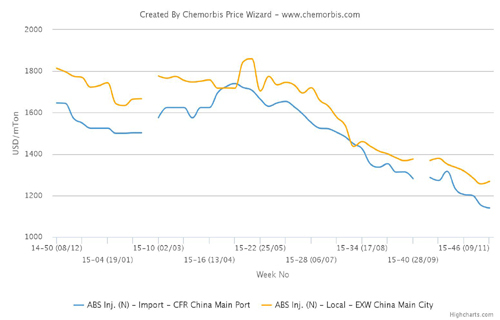 In China, both import and local ABS markets have hit the lowest levels since the beginning of 2012, when ChemOrbis China ABS Price Index was first launched. New prices emerged with fresh declines for December driven by lower production costs in Asia with respect to a month ago. Players also blamed muted demand heading to the year-end amidst a slower economy in China as another reason behind the renewed price drops for ABS. Another ABS maker was said to have reduced their operating rates for the first time in years in order to keep their offers stable for December. They are running their 830,000 tons/year plant at 85% from the previous 100% nowadays. Meanwhile, media reports showed that total domestic production of household air-conditioning units declined 27% on the year in October while domestic sales were also down 31.3% from a year earlier, suggesting weakness in a major ABS application. An agent of a South Korean ABS maker in Turkey argued this week, “ABS and HIPS prices are almost on par recently although ABS should traditionally carry a premium of up to $200/ton over HIPS. ABS makers will try to recover their margins at some point.” New December offers were announced with drops of up to $30/ton to this country. Looking at the upstream chain, spot styrene costs were down by $35/ton on FOB South Korea basis since early November, while butadiene prices plunged by around $95/ton in the same period amidst fluctuating energy costs during the last one month. 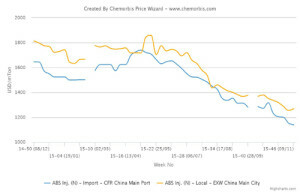 Spot ACN prices, in the meantime, soared $65/ton on CFR Far East Asia basis from a month ago as reported on www.ChemOrbis.com.